Four more days to make the month of Kate Motaung's October 2015 edition of 31 days of free unedited writes, this is day 27. Intro: when Kate gave us an opp to suggest prompts for this month, I had my say, but since I didn't keep a list, I don't know if she chose any of mine. However, I can tell ya, "perhaps" was not one of them! It's not a word I use more often than once a decade or so. I far prefer maybe—or occasionally possibly. Perhaps sounds contrived, formal, and pretentious, though words from the same root such as happen and happenstance, haphazard and hapless don't bother me at all. "Perhaps" in my journaling book and on my keyboard is similar to pesky, redux, mauve, garbled, boho, eschew, and a few others. Long way of explaining why "maybe" is my word for today. 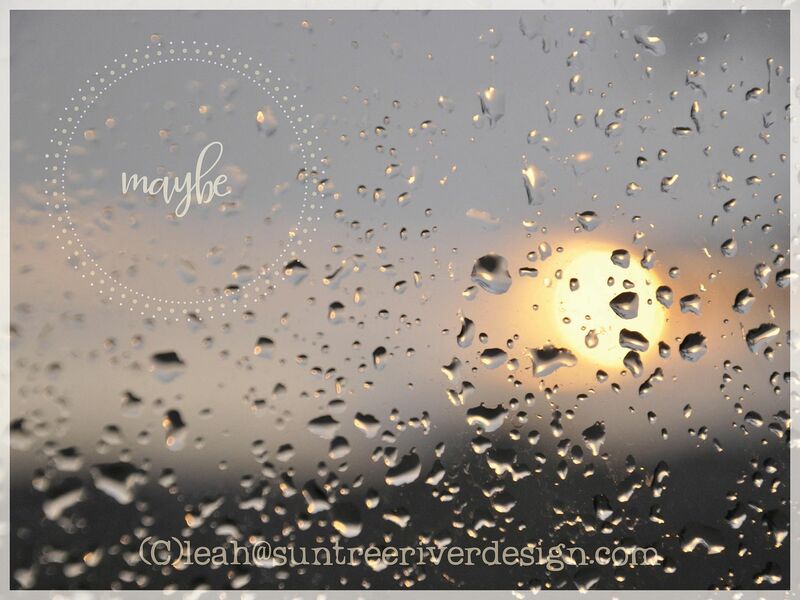 Words like maybe, possibly, (perhaps) need to include a picture of rain and lots of hope. Too many unforeseen, untoward, unanticipated and – even by later on – pretty much unexplainable events have been going gone down in my life, with far less than the eventual outcomes I'd expected by now. A roundabout way of saying I still have dark, dreary, rainy, cold days. Then there's California's close to desperate drought—except desperate means "without hope," and if we steward creation in the power and presence of the Spirit, how will planet earth be anything but replete with hope? "Water is life!" Water is the womb of the first creation, of our first and second births, of the new creation in Jesus Christ. Our bodies are at least 50% water. The oceans are this planet's circulatory system. You know salt water heals anything! Tears, sweat, the ocean. So maybe, just maybe, rain will pour down from the skies again so creation can thrive and flourish again. Maybe, it just may be that my own rainy days will become bright. We know the sun's always there and always shines somewhere. Maybe, possibly (perhaps) rain? Yes! Maybe, possibly (perhaps) sunshine?! Yes, absolutely, truly, indisputably, indubitably, for sure, for all of us. Outro: Rain image with reuse rights from arien on Morguefile; graphic embellishment by me, suntreeriver design. Serious drought banner (this time my photo and again my design) features mustard plants alongside the San Diego River in Mission Valley.